Bilfinger Tebodin’s Industrial 360° scanning and software reproduces facilities in a photorealistic environment. Industrial 360 allows operators to visualise all pump information. All the relevant information regarding the pump is available on either PC, tablets or mobile devices. Industry 4.0 has been hailed as a 21st century Industrial Revolution, seamlessly combining manufacturing and digital technology to increase productivity and efficiency. One Dutch consulting and engineering company is using two technologies to help industrial plants prepare for the digital age. Bilfinger Tebodin opened for business in the Netherlands in 1945, during a period of post-war reconstruction. Its original objectives were to make an active contribution to the technical and economic development of post-war Netherlands – an ethos which has developed and expanded to a European and international level as the company has grown. Today it is a multidisciplinary consulting and engineering company that offers services to international and local clients based on the knowledge and experience of its 3200 consultants and engineers. It works in a wide range of market sectors, including industrial, food and beverage, energy and utilities, oil and gas, chemical & petrochemical, infrastructure, pharmaceuticals and property. 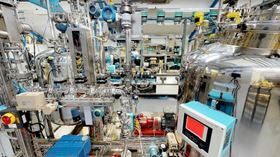 Bilfinger Tebodin recently announced its digital packages for UK industrial plants, supporting them with Industry 4.0 and taking them through the first steps into digitalisation of their processes and connecting and sharing their process data. Using digital technologies offers advantages both in terms of the quality of the end products and the reliability and efficiency of facilities. Bilfinger Tebodin shows its clients how to respond successfully to a rapidly changing industry, market demands and conditions. 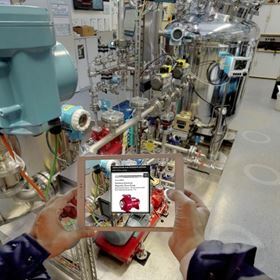 The digitalisation support that the company has recently introduced for use in UK industrial plants makes use of two different technologies; Building Information Modelling (BIM) and Industrial 360, a digital tool developed by Bilfinger Tebodin. Building Information Modelling (BIM), has been in use for a number of years for both residential and commercial construction. However, it is still relatively new to the industrial sector. It’s a collaborative way of working which unlocks more efficient methods of designing, creating and maintaining of assets. BIM is a method that views design, construction and operation as a whole - taking the life cycle approach. The company collects a large but smart selection of data about a project and uses it to create models. These models give clients an overview of what to expect from their new assets which allows them to make strategic design choices at a very early stage and with greater financial security. Using BIM means that several extra dimensions can be added to a project. Where traditional construction relies on 2D drawings and printed reports for information sharing, 3D digital models of a building or plant allow clients and project teams to view a design as if it has been built already. The aspect of time makes it 4D. The construction process can then be viewed as a digitised video, which is very useful in planning design, construction, procurement and logistics and for detecting and preventing clashes between sub-schedules or design elements. Adding the cost aspect makes it 5D, where financial data about the elements of design, construction and the consequences of a design change can be visible in a matter of hours. Sustainability goals make it 6D. Strategic decisions regarding maintenance can be made by adding maintenance data, making the project 7D. The Chinese car manufacturer, Great Wall Motors, made use of BIM when it acquired a new production facility in Tula Oblast in Russia to produce 150,000 new vehicles a year to sell within the country. The facility covers 229 hectares of land and comprises more than 70 buildings, as well as 2500 residential units for workers. In view of the scale, complexity and tight time schedule of the project, the engineering and design team took the strategic decision to use BIM technology from Bilfinger Tebodin. It allows their team to create a detailed 3D building design, based on the input of the different disciplines at all different stages from concept to detailed design. It cuts time spent on design work and provides real-time lists of materials, specifications and equipment. The BIM technology was the most efficient way to execute the large and complex project from one country to another. BIM is often used alongside another digital tool, developed by Bilfinger Tebodin. Industrial 360 is a scanning system which captures industrial sites in a photorealistic way. This together with 3D point data from the site itself creates a transparent information model in high definition (HD). The virtual walkthrough can be used for design modifications, maintenance objectives, safety inspections, turnarounds and training. The technology has been extensively used for factory modifications at large petrochemical companies, HAZOP studies and updates of safety valve calculations, new laboratories in the pharmaceutical sector, the renovation of an outdated production unit in the food sector and the expansion of an existing glue-production facility. With Industrial 360 it is possible to visualise all pump information. For instance, a pump can be identified within the photorealistic model and combined with pump curves, manuals, spare-parts listings, and supplier information. As well as engineering or maintenance, software packages can be linked with each other. By applying this technology, operators have all the relevant information regarding the pump available on either PC, tablets or mobile devices. Specific documentation as well video files can be integrated, for example a safety instruction from a pump supplier when disassembling a unit. 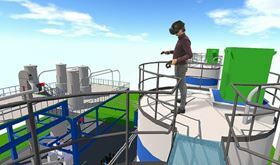 Industrial 360 can be a starting point for BIM and is an efficient way of working together, but Industrial 360 must be translated into a digital model (3D or VR) to work with BIM. Industrial 360 is an entry-product, a kind of Google street view of your plant or installation, that gives fast, user-friendly and cost-effective insight into the present plant situation. With BIM, a client can create a 3D (or higher dimension) or a VR model to visualise new factory or installation in order to unlock the most efficient way of working when designing, creating and maintaining assets. Bilfinger Tebodin has used Industrial 360 and BIM for several years with its European clients and increasingly, it is using it for almost all projects. Recently it was approached by a company in the food sector in the Netherlands that was searching for an easily applicable technology to move them into digitalisation, where engineering, training and maintenance could be combined. When Bilfinger Tebodin worked through a pilot phase for the company, it found it was able to help the client to integrate all data into Industrial 360. The client wanted a simple way to begin to digitalise a certain processing part of its production plant and wanted to integrate upcoming maintenance projects. By applying the Industrial 360 3D scan, all staff involved were able to directly visualise the projects. After the first information sources were applied to the model, other internal stakeholders also showed interest in the digital model and Bilfinger Tebodin was also able to successfully integrate what they wanted. The client concerned is now using it as a shared resourcing tool for the engineering, maintenance and quality assurance department of this company. Digitalisation will increasingly shape future factories and assets and will be the basis for successful production. This is because it allows data on process progression and optimisation, output, the use of equipment and employees and market developments to be shared for the purposes of optimisation and analyses. In this way data can contribute to increased investment security. More than this, the exchange of data will also result in stronger connections between the factory floor, engineers and management, which will ultimately result in better responses to market demands, feedback on products from the market and greater efficiency in delivery. Bilfinger Tebodin are increasingly using Industrial 360 to support clients and BIM in large engineering design projects, more companies are realising that it is an efficient way of working together that gives higher quality, lower costs and better control.